I had visited the nest ten days earlier when the chicks had just hatched and where still naked. 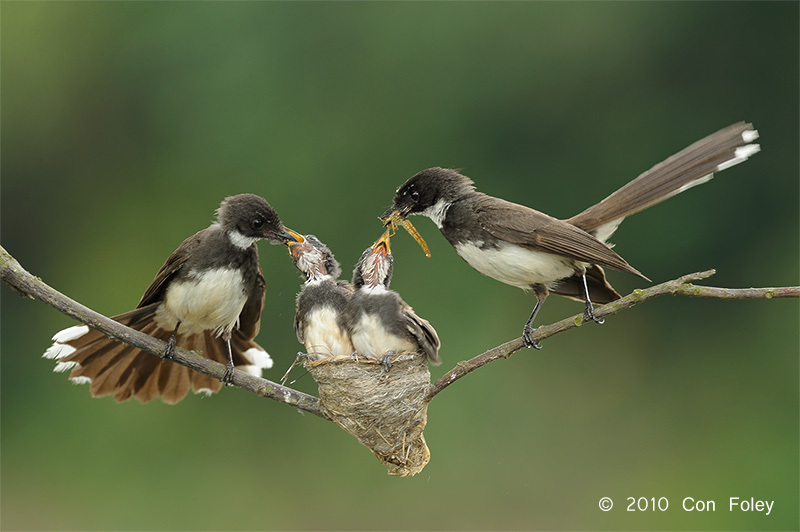 One parent or the other brought food, but I did see one occasion where both parents were at the nest simultaneously. I knew that was the shot I wanted to get when the chicks where older and feathered. I felt showing the entire family together would best portray all the hard work these little birds do to rear a family in such a tiny nest! So I came back on July 8th and framed the subject with enough room get both parents with their large tails into the picture. I was laying prone on the ground and with the lens resting on the ground, because the nest was just slightly down a slope. It was a late overcast afternoon and the light levels were low, so I used a small amount of fill flash to lift the shadows of the dark colored subjects a bit. The flash was mounted on a tripod about three feet from the camera to avoid red eye and the power was the minimum 1/128 with no flash extender. The parents came and went singly with their feeding activities. The birds were quick and each feeding lasted just a few seconds. As good fortune would have it I got one cycle were both parents brought food to the nest simultaneously. I got two frames that were usable, this being one of them. I went back the next day but I didn’t see this behavior happen again and within a couple of days both chicks had successfully fledged. Equipment Used: Nikon D3s, 600VR, 1/160s, f8, ISO 1600, flash. The shot is uncropped with minimal post processing.